Your class of 2010 Fantasy Football Rookie News since June 28. Catching you up on two weeks of news, but one of them all rookies were at a mandatory NFL rookie symposium, so not much was going on. Your class of 2010 Fantasy Football Rookie News for the week of June 21. Your class of 2010 fantasy football rookie news for week of June 7. 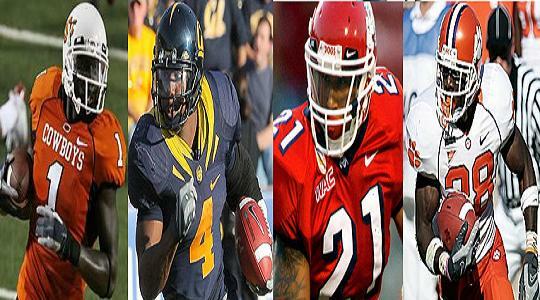 These are the news stories on the top fantasy football rookie prospects from the class of 2010 for the week of May 31. Here’s your top news stories surrounding 2010 fantasy football rookie prospects for the second week of May. That didn’t take long. I thought so earlier, but I am now certain of the top four fantasy football rookies after only the first day of the NFL Draft. Just now we know where they’re going to play. Jahvid Best jumped ahead of CJ Spiller in QBallers’ post-combine/pre-draft 2010 fantasy football rookie rankings released on Thursday. Ben Tate and Ryan Mathews also moved way up.